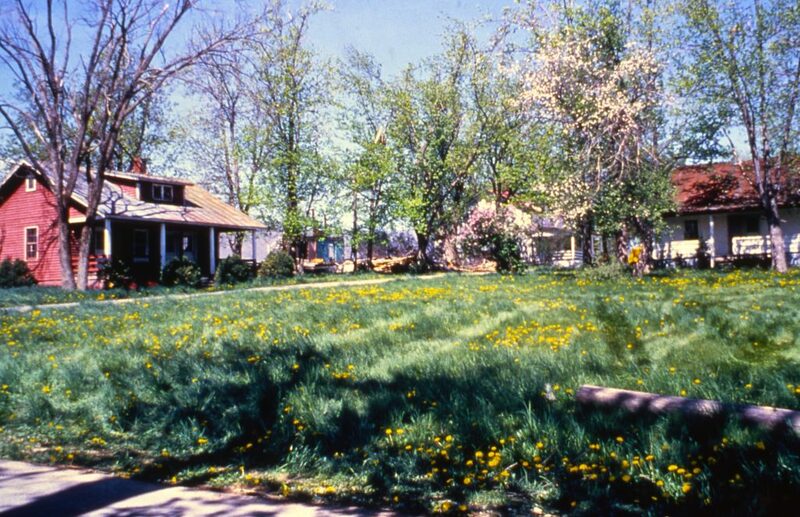 In 1977 and again in mid-1978, Alan Chadwick travelled to the East Coast before finally coming to the Shenandoah Valley in Virginia to begin his final Garden Project. He made these two trips by train with one Covelo apprentice, before finally arriving at the Carmel In The Valley Community for good in the late summer of 1978. Alan’s first trip was to Hendersonville, North Carolina in late 1977 to meet with John Shuttleworth of Mother Earth News and to make a site visit to the magazine’s land to see if it was a good fit for the Garden Project. Alan’s second trip by train was to see the Carmel In The Valley land (just south of New Market, Virginia) and to meet with the leadership of the Fellowship of the Inner Light, a spiritual group from Virginia Beach that held an option to purchase an old estate, then used to raise Black Angus cattle. Alan arrived with one Covelo apprentice in the late summer of 1978, and began his final project there. The one apprentice who had arrived with Alan left for Washington, DC and New York to visit family and promote the new project, while for a month, a new apprentice assisted Alan in laying out his new garden plan, shopping for tools and equipment, and organizing the entire project. Meanwhile, two Covelo apprentices drove an old rebuilt truck cross country from California, loaded with Alan’s personal belongings and some plants from the Covelo Village Garden. Alan Chadwick’s Red Cabin. Photo courtesy The Chadwick Society. Fundraising began in earnest. An old Lord & Burnham greenhouse near Roanoke, Virginia was found, dismantled and rebuilt at Carmel In The Valley. Cold frames were constructed, and the garden was underway. A few former Covelo apprentices came later, and a core group of new apprentices began arriving from all over the country. Many people came to the community and ended up working in the garden as volunteers. A core group of about fifteen apprentices gelled, and remained until the land was re-acquired by the owner, and the community and Garden Project disbanded in December of 1979. About four to five acres came under cultivation, livestock was raised, and ley areas were planted. The photo gallery aptly demonstrates the abundant results. Plans were drawn up for a garden village that never materialized. Sadly, the plans were lost. During his time in Virginia, Alan gave a superb set of lectures to apprentices. Most of them are preserved on tape. In the autumn of 1979, Alan’s health began to seriously decline. Kathleen Acacia Downs stepped in and acted as his hospice nurse from this period until his death at Green Gulch Farm, Marin County, California in May of 1980.